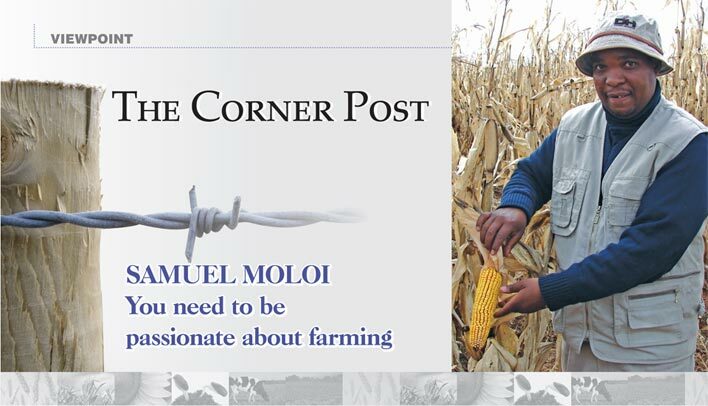 When Samuel Moloi received the award as the 2009 Grain SA Developing Farmer of the Year he realised that his childhood dream of becoming a farmer was now a reality. As his father was a farm worker, he was raised on a farm and farm life excited him as a young boy. “When I was young I saw everything on the farm – from the cattle to how a tractor works and I just loved it!” he explains excitedly about where his passion for farming arose. Samuel currently farms in the Fouriesburg district where he leases 700 hectares of land. He focuses on crop farming as it is very important to him to play a role in ensuring food security. He plants maize, soybeans, wheat, dry beans and sunflower. To him the award he received was a tremendous honour and he sees it as ‘an injection’ to improve his farming skills. When he started farming he harvested only 2 t/ha on maize and 1 t/ha on wheat. Through the skills and knowledge gained by the training Grain SA offered he has become a more substantial farmer. ‘I am now harvesting 6 t/ha – 2t/ha to 9 t/ha on maize and have harvested 4,5 t/ha on wheat.’ At the time of the interview he had cautiously only planted 130 ha of maize and 105 hectare soybeans due to the dry conditions. He is however someone with a strong faith and believes the rain will come. This farmer, who is motivated by his love of the land and farming, mentions that increasing his knowledge was the main contributor to his success. He mentions that the knowledge he has gained about relevant topics like fertiliser, tillage methods and crop rotation came by attending study group meetings, training courses and farmers days presented by Grain SA. He adds that the Grain SA mentorship programme is crucial to the success of developing farmers. He has attended courses about crops, implement maintenance and many more, but would like more training on the financial aspects of farming. ‘This is the crucial side of farming. A farmer must know his budget for the different seasons,’ he explains. Samuel sums up his advice to emerging farmers in four words: Passion, knowledge, communication and prayer. Passion: You have to be passionate about and love what you do otherwise you won’t survive. If farming is not in your blood, do something else. You need to be patient as you don’t make money within a month, but there are so many other rewards. Knowledge: Get the knowledge about farming – theoretical and practical. Once you start farming, increase your knowledge by attending training courses, study groups and farmer days. To do the job, you need to know what to do. Communication: Communicate with others who know more about farming than you do. Experienced farmers can help you solve problems. Do not be too proud to ask for and listen to advice. Remember, there are always people who know more than you do. Prayer: Pray. Ask God for help in good and bad times. ‘I don’t think there is a person who prays as much as a farmer. We have been chosen by God to produce food for his people.’ Also remember to say thank you when He answers prayers.